Red Dogwood Tree For Sale - LowPrices Online, Fast Ship. 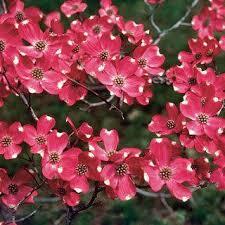 The Red Dogwood Tree is used by many homeowners and landscape artists for its brilliant multi-faceted scarlet blooms. These long-lasting flowers flourish in April and May. This tree is also a significant resource for many animals including birds, giant silk moths, mammals, pollinating insects, and bees. The fruit of this tree ripens in autumn months and consists of a nutritious high-fat content that over 35 bird species love. The Red Dogwood has a medium growth rate and matures to approximately 25 feet tall. The oval leaves grow anywhere from 3-6 inches. A Red Dogwood Tree can bring life and brilliance to any flat yard. Their immense foliage provides excellent shade for animals and humans alike. Red Dogwood Tree is Native to Eastern North America. Looking for a tree with beautiful red flowers to add to your yard? Then look no further than a red dogwood tree. Native to North America, this particular species is very a famous landscaping tree because of how it looks, especially in the spring. This easy to take care of tree blossoms each spring with either red or pink flowers that give the tree its name. The tree looks celebrated in more than just the springtime. It is a native to Eastern North America. The Red Dogwood tree blooms with red flowers in the spring months and then reddish-purple leaves in the fall. The height combined with the red and pink flowers make this a stunning addition to any part of the yard. The Red Dogwood Tree not only can bring a great deal of beauty into one’s yard but it can also attract small animals and wildlife. With a significant amount of color from the blooms they attract the attention of birds and often hummingbirds as well with the beauty. Red Cherokee Chief Flowering Dogwood is also known as Cornus Floridus. The best zones to plant this dogwood is in hardy planting zones 5-8. They typically grow one or more feet per year. This tree adds lots of beauty when added to gardens and lawns. It will look amazing when in bloom. It will also provide lots of color to all areas. This tree grows to be 20 to 35 feet tall and can be 20 to 25 feet wide. It can mature and thrive in both full and part sun. This tree works excellent in gardens and natural areas. It will bring brilliant rose red color with the blooms during the spring. It will also have berries that will attract birds and squirrels. This tree adds a lovely curb appeal to a home and will be beautiful. This tree is easy to grow on large or small lawns and gardens. 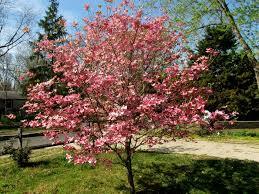 The dogwood will thrive best in average to medium amount of moisture and in soil that is well drained. It prefers for the earth to be moist and rich as well as acidic. Putting mulch around the tree will help keep the moisture in and also keep the soil fresh during the summer. The branches of this particular dogwood are low branching and will make a pyramidal shape with a somewhat flat top when fully mature. This dogwood will need to water regularly. It will typically need to be watered at least once a week. In places or times that it experiences extreme heat, it may need to be watered even more.